There are nearly half of the FFXIV classes are gathers and crafters since there are numerous kinds of materials and folks can do what they want. 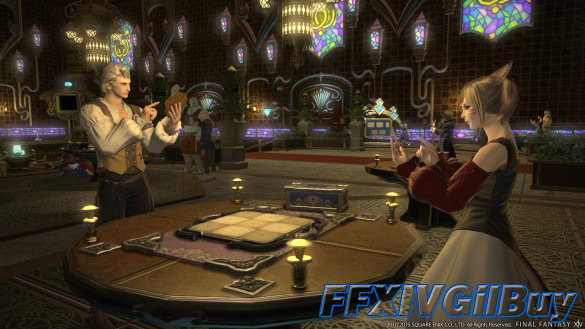 Many players choose gathers or crafters first for earning enough FFXIV Gil. When they make enough FFXIV Gil, they turn to choose some powerful classes. If you don’t have enough FFXIV Gil, FFXIVGilBuy provides huge stock of cheapest FFXIV Gil. This guide is to analysis some ways to make FFXIV Gil by gathering and crafting. At the beginning, some rich crafters pay a lot to buy mats which are easily gathered by gathers, which makes gathers gradually become rich. When crafters train to a certain level, they start to sell tools and gear back to gathers. In this process, gathers and crafters can get what they need. However, there are the raiders who doesn’t gather or craft, but buy gear from the Market Board and their cash finally go to crafters. They farm items that drop from monsters and dungeons. Then sell them on Market Board for FFXIV Gil. At last, crafters will pay good price for those items. In FFXIV, once crafters get the highest recipes, they can break it down and know every item they need. Though there are some low level and cheap items. Once calculated, these items can be sold for money. Then crafters can simply clear the Market Board for items. The crafting gathers can go and gather those mats for their own, then sell the extra at high price. For gathers, they know what crafters need, they can make some quick money in this way. Like FLAX in Heavensward, Ramie Thread requires Stalk of Ramie and Flax. At the start of Heavenward, crafters are leveling Weaver as they can craft the highest crafting gear, which make them earn a nice amount of FFXIV Gil. Stalk of Ramie is a new Heavenseard item, and flax is a very low level ARR item from Botaniest. Since all the flax are cleared from the Market Board, the price becomes extremely high. All in all, take up the miner pickaxe or botanist hatchet and starting hitting every node you know, and sell all of them, and try to cover everything until you find something hot. Ask crafters who know what are hot and gather those hot items. If you have everything you need, you can play dungeons and fight bosses to gain high-end items to make more FFXIV Gil. Hope this guide is helpful for your making FFXIV Gil.